Dennis Johnson of Chicago is proof that you don’t need to be an experienced veteran to compete on the handicapping contest circuit. A 46-year-old handyman and accomplished pool player, Johnson qualified for the world’s richest and most prestigious handicapping tournament – the $2.8 million (estimated) Daily Racing Form/NTRA National Handicapping Championship presented by Racetrack Television Network and Treasure Island Las Vegas, Jan. 27-29, 2017, at Treasure Island – in his first attempt. 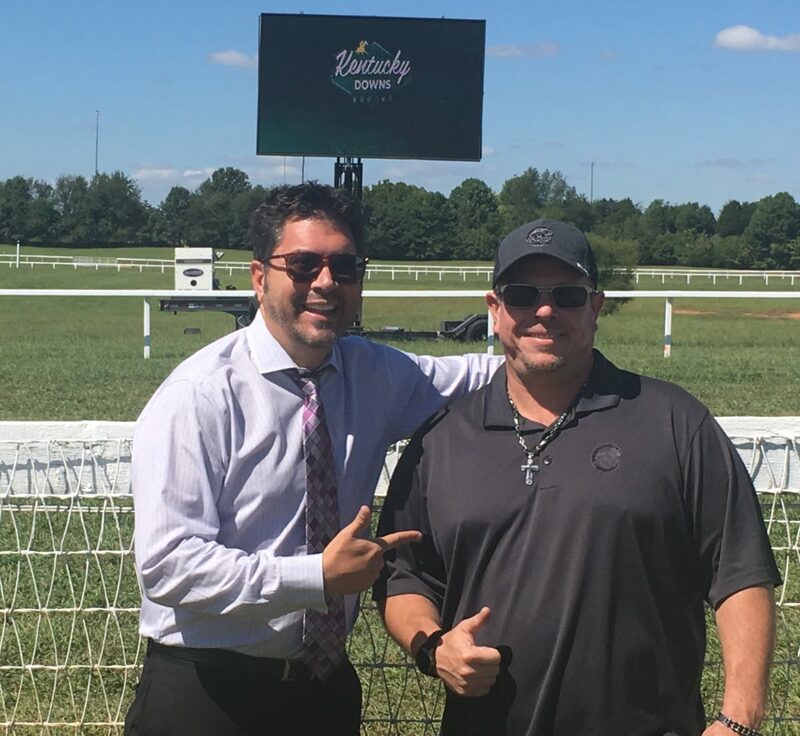 Combining a barrage of short prices with one decisive longshot play, Johnson defeated a field of 102 others entrants in Saturday’s Kentucky Downs Turf Handicapping Challenge. What was your strategy going into the Kentucky Downs contest and how did you manage to get the job done? “We flew in from Chicago that morning. I got two entries and figured that one would be my ‘nice and steady’ ticket with what I really thought and the other one would be longshots so that if just one of those came in I wouldn’t be totally out of it. It just happened that I hit the first four races on the ‘nice and steady’ ticket. None of them paid more than $11 but I knew I was in contention. “When the storms came (there was a 20-minute delay before Race 7 on the 10-race card) was when I decided I needed to make a move. I really liked Lots o’ Lex [in the $150,000 One Dreamer Stakes] and I knew she’d be on my longshot ticket but she was coming out of Chicago and had some big races in her past so I decided to use her on my good card. She went off as a 12-1 shot so after that I knew I was in it to at least get one of the three NHC spots. Lots o’ Lex was a total flop in the Beverly D. and had a nearly a one-year layoff before that. Why did you like her so much? How did you first find the track and become a fan of horse racing? Why did you decide to make the Kentucky Downs contest your first NHC qualifier? Joe is a very sharp handicapper and obviously follows Kentucky racing very closely. Were you able to consult with him much during the contest? What tools do you like to use in your handicapping? “Well, there’s this skull that I found at Balmoral Park. We were probably 18-years-old and one of my friends had a house near there. We’d go for the whole weekend, playing cards, gambling. One Friday night we lost all our money and were leaving the track and I came across this little rodent skull in the parking lot. I picked it up and that night when we were playing cards I couldn’t lose. I took everyone’s money. Then the next day at the racetrack we were hitting trifectas and everything we bet. I still have it and Joe said I had to bring it to Kentucky Downs on Saturday. If you could choose between winning the NHC for $800,000 or the Cubs winning the World Series this year, which one would you take?